Clark has now spent around a month as part of the Mythbrawl underground fight club. As part of the team of fighters he has become an adored celebrity. In fact it's part of how Mythbrawl functions, the more the fighters are adored by fans while reenacting their greatest battles, the longer they can survive long after their legends have faded. After another successful night, a battered Clark heads backstage away from the cheering crowd and directly into a meeting with Ringmaster Shahrazad. To give the gift of healing Shahrazad must 'read' the story of the wounded, and if the story is true, the healing will complete. She looks into Clark's past and tells him that he has always felt an outsider, by being the perfect citizen he fit in, but despite being a beloved hero, he was only loved by the public because he was strong, not because he was good. Clark is shaken and denies the 'reading' though Shahrazad assures him her power only activates with the truth, sending Clark racing out onto the streets. Elsewhere Jimmy Olsen and Condesa are trying to track Clark down. When they arrive at a Big Belly Burger, Jimmy remembers when Clark took him for his very first burger and his first major photo of Superman. At the same time Haemosu leads Clark into a city backstreet and into an underground bar filled with metahuman civilians. As Clark and Haemosu put away a few drinks, Clark tells his new friend about the clone of Apolaki and how he suspects that someone kidnapped and killed the original fighter. Clark is shocked at Haemosu's reaction, but the fighter explains that as long as the legend of Apolaki is told and retold, he will eventually be reborn, because he is a god. Haemosu points out two female metahumans that were former lovers of the missing fighter, one a ghost, one a werefox. The girls reveal there is no love lost between them after he left them for a girl called Yurei. One of the girls saw him being abducted by men with no faces, but as a woman scorned and ignored she left him to his fate. As Clark and Haemosu leave the bar they are confronted by Jimmy and Condesa. Jimmy tells his friend that the Daily Planet has been writing trash stories, destroying Superman's reputation and that he is writing the true story, albeit via a blog now he is unemployed. Jimmy is desperate to salvage Superman's good reputation as a true hero at his heart. Clark tells his friend he doesn't care what people think of him anymore. When Jimmy discovers Clark is an underground prize fighter he looks to Clark for an explanation. His friend can't bring himself to explain his motivations and turns his friend away. Later Yurei is binge watching Superman's Mythbrawl fights. She is so engrossed however that she doesn't hear Clark break into her quarters and then her metallic arms. Clark asks Yurei why if Hordr_Root has known he was hiding in Mythbrawl he let him be. He then realizes that while in hiding his powers have been steadily returning and Hordr was just waiting till he could take Superman again. Yurei tells him that in the old Hordr_Plex they had originally intended to kill Superman, not drain him but now they have even bigger plans, cloning sandmen was never part of the plan, but an unexpected byproduct of the energy drain. Suddenly a Sand Superman appears and clashes with Clark. The process wasn't complete, he's only at 80% and they need Clark to drain off the remaining 20% of power he has left. This Superman might have all of Clark's original powers but Clark thinks back to the life Shahrazad had shown him. The Kents nurtured him and he learnt how to control his power, this gives Clark an advantage and as the Sand Superman readies a blast of heat vision Clark prepares to defect the blast with a metal door. Clark watches the blast fire, and then pass him by hitting someone in the doorway behind them. Jimmy and Condesa had been tailing Clark and the heat vision from the clone blew a hole in Jimmy's chest but in turn seemingly blinded the clone. Clark cradles his dying friend and as Jimmy passes away he tells Clark that he knew he was always a hero. Suddenly the monitors blink on and replay the threat Superman made months ago. As it ends a gleeful Hordr_Root appears and asks him, now that a friend of his is dead, to act upon his promise and come for him once more. Story - 3: Remember Gene Luen Yang's original premise? Going back to Superman's roots, looking into his rich history? It faded into the background as this arc continued but suddenly we have many elements of Super history brought forward. Suddenly a classic storyline comes into play. I hadn't made the connection with Apolaki being made of sand until now but, years before in the early 70s DC de-powered Superman, not to the scale that has butchered him now but his days of juggling planets were gone. In the Denny O'Neill era story the newly de-powered Superman had to fight a Sand Superman duplicate that used his own powers against him. 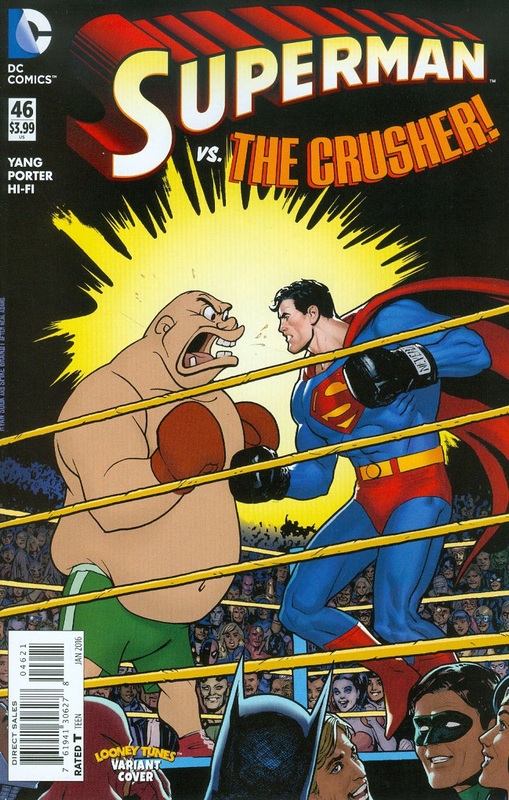 Walter Simonson retooled and retold the story in the 1990s, having Superman use his wits to defeat the Sand Superman.�Instead of a battle of wits Yang uses Clark's memories of the Kents, which Shahrazad had stirred earlier, to best his opponent. However in a twist, instead of the creature being defeated,�Jimmy Olsen is killed. The king combatant Haemosu, for those that don't know, is a Korean sun god. I am curious as to why, when Superman has visited the sun itself twice now to recharge, instead, continued exposure to Haemosu is what is actually making him super again? Also the underground bar? It reminded me of the metahuman street in Birds of Prey (TV), Freak Nation in Dark Angel (TV) and even the club in Angel (TV). Heck it even had a horned demon as the owner. In the DCU I think it feels like it should exist, I just couldn't see Superman in it nor his non-reaction to it. I'm not really sold on Clark's memory of being a public figure only because of his power and his hiding out in Mythbrawl for a month just seemed like he was giving up. I liked the detective work, it started well but was skimmed over (how did he find Yurei?). I know the character moments were needed but if you are having Clark do an investigation - follow it through fully. Why did Clark wait a month to look into Apolaki's death? I liked the moments with Jimmy, and his discovering his best friend had lost his way. It reminded me of Ricky Lang in Superman III when he tried to reach out to evil Superman. Indeed there were hints of the Donner movies here and there and even more nods to comic history in the art. I still can't see how this will marry up with the Pak driven story in Action Comics, but at least Yang has delivered a bit more on his promise of incorporating elements of Superman's past. Not a great issue, mostly because timeline wise it doesn't fit with how Clark is suddenly driven to investigate. Art - 5: Wow, the art is just brilliant, I feel like I'm being spoilt after months of shoehorned in ropey art by JRJr. You might feel like I'm doing JRJr. a disservice but the attention to detail this issue threw me. Especially in comparison to recent previous issues. I wasn't prepared for how many 'easter eggs' there were. Stan Lee, The Puzzler, Quitely's Emporium, Swan's Books, Byrne and Ordway antiquities, pointing out the new "S" shield. It's all there if you look and that is why Howard Porter continues to be a breath of fresh air. 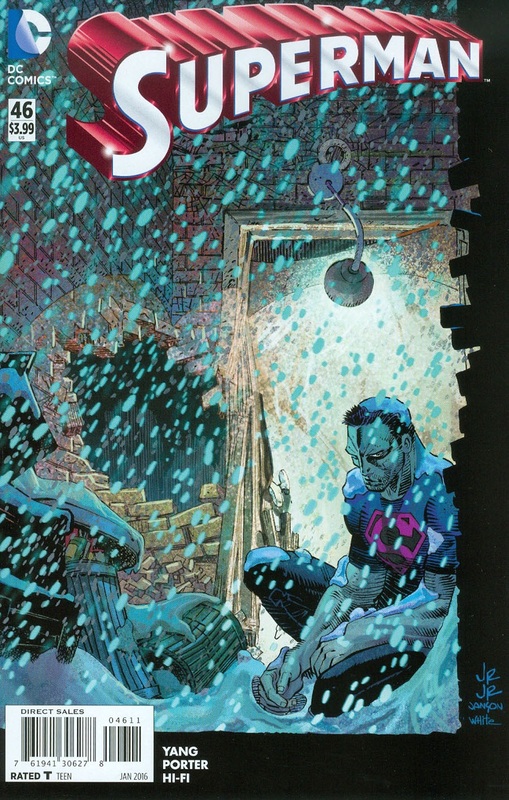 Cover Art - 3: Considering Sand Superman - a classic Superman element, and the death of Jimmy Olsen - having a moody Clark sitting in a dark alleyway just seems so lackluster and a lost opportunity. Looney Tunes Variant Cover Art - 5: How fantastic is this cover? I want this as a poster, it's just brilliant! The mix of styles, the inking and the soft brush coloring make this such a vibrant cover. It even loosely fits with the story inside. Bravo!